A HP hand pump made entirely of aluminium for precise and lightweight construction. The barrel, handle, piston, end caps, and frame pump mount are all custom CNC-machined. 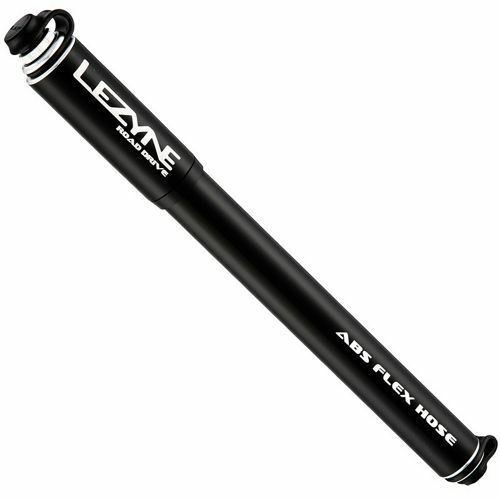 The HP design makes this a frame pump replacement, inflating tires to riding pressure with 20% fewer strokes compared to conventional hand pumps. Comes equipped with ABS Speed Flex Hose. Speed Flex Hose: Reversible, Presta only threaded and Slip-Fit System hose for fast valve engagement. Features ABS in a flexible design that stows inside pump handle when not in use. Air Bleed System (ABS): When using Presta valves, pressing the ABS button releases air back pressure in the pump hose making it easy to remove the Flex Hose or Flip-Thread Chuck from the valve. ABS eliminates the challenge of unthreading removable Presta valve cores after inflation. When using Schrader valves, press the ABS button to adjust tire pressure. Aluminuim Construction: Aluminium is a lightweight, durable material used for handles, barrels, pistons, and various other pump components. Pump Bracket: All hand pumps include a frame mountable pump bracket for easy storage while riding. CNC Machined: Custom CNC-machined aluminum parts for precise and durable construction.